The card’s affirmation for us is: “Love is the answer to all of my questions“. Take a moment to think about what love means to you? Is it really a feeling? Or a state of being? Could you accept you are love? Pure love in truth, the real you. Love is kind and gentle, all encompassing. We must love ourselves before we can fully love others. Accept yourself, be kind to yourself, treat yourself well. Be who you are and allow that love for you to heal your darkness and trouble – your own light will melt the darkness and become light again. 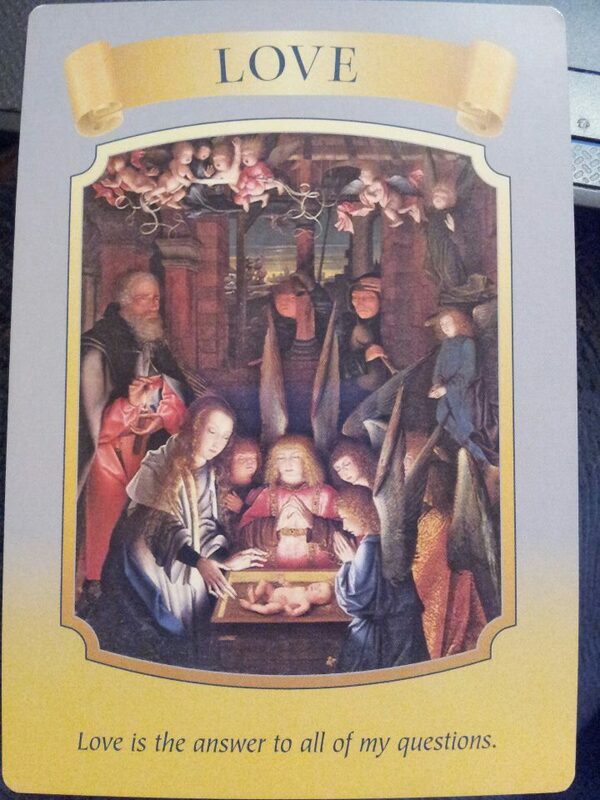 “This card reminds you that feeling loved is your true desire, and this very condition is continuously offered to you by God, Jesus, Mother Mary , and the angels. Surround your current situation and relationships with love, which will loosen the bonds of ego attachments. When you pray for love to heal your situation, God sends angels to your side. Belief in the self is so powerful. Please believe in you and your inner power that is love.